Understanding the benefits of supporting a robust transit system in helping achieve environmental goals, CU Boulder has committed to providing passes for students and qualifying employees. The passes provide access to all Local, Limited, Express and Regional bus service, in all fare zones, including the SkyRide bus service to DIA*. Utilizing smart card technology, you just tap your pass on the card reader as you get on the bus, show the pass to the driver and find a seat. It’s that simple. Part-time continuing employees - Working a 50% or greater full time percentage appointment. Continuing employees include Classified Staff, University Staff and Faculty with permanent appointments. Retirees - Employees who have retired from and returned to work on the CU Boulder campus. CU retirees who do not have an active work appointment on the Boulder Campus or for CU System. EcoPasses are distributed by the Buff OneCard Office, located in the Center for Community (C4C) room N180. Phone: 303-492-0355. 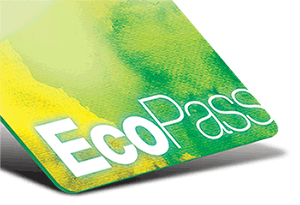 New employees who are eligible for an Eco Pass will receive their smart card at the same time as their Buff OneCard (university ID card) . Replacements for lost or damaged cards require a $10 fee. If your pass shows as either Dormant or “Invalid” when scanned on the bus, please send an email to buffscommute@colorado.edu. Use your Eco Pass to get great discounts at local shops!